Updated Tuesday November 13, 2018 by Ed Romero. 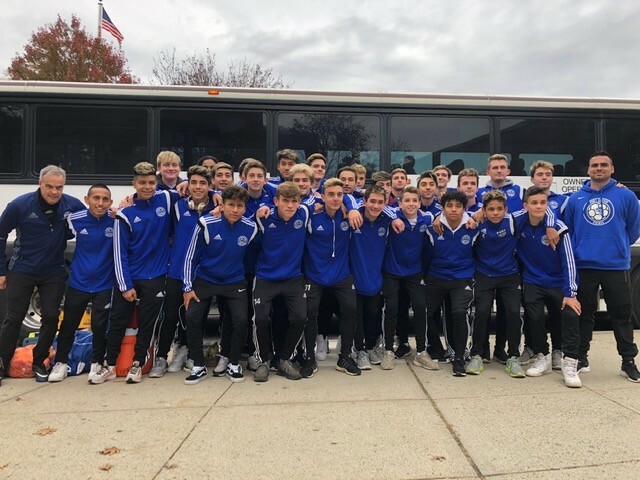 After winning the Long Island Class AA Championship last Sunday, the Boys Varsity Soccer team, made up of mostly Port Washington Soccer Club players, traveled to Middletown High School to face Clarence in the State Semifinal. The Schreiber Boys team, coached by Don Fish, has enjoyed unprecedented success this season and has arrived at this exciting time as a true Cinderella story. The boys sneaked into the playoffs as the 8th seed and eliminated seeds 1, 5 and 3 for their first county title. Every game was a nail-biter with a one-goal margin of victory. Charlie Gilsenan, who's father Lou has been a PWSC coach for many years, scored the winning goal in the Championship with under 9 minutes left in the game.